As a member of Christ’s body, what do you do when it is your turn to suffer? I can only answer for myself, but usually, I am blindsided by suffering. Stunned. Suffering knocks off my spiritual “game face” and leaves me scrambling to figure out what just happened. It’s as if someone abruptly threw me in a body of water that I didn’t even know was there, and so I have to first spend some precious seconds figuring out what is going on, where I am, and which end is up. There is blind panic and immense disorientation and flailing, and when I finally haul my soaking, drowning self to shore, I spend a good amount of time heaving onto the sand while wondering what happened to all those things I was carrying with me when I was tossed into the sea. And then, faith bobs to the surface (thank God–it floats! ), and love pops back up, as well. But so much else–so many hopes and dreams, so many plans for the future, even so many cares and concerns–sit heavy on the bottom of the sea, never to be seen again. And as I lay, gasping, on my back, still trying to get my head around what just happened, I am faced with two very different temptations. One is to never get up, to just curl up into a ball and stay on that shoreline, mourning what I lost. That’s a real temptation, but only for a little while. The only thing is…that’s not true. Everything wasn’t beautiful, and sometimes it hurt a lot. 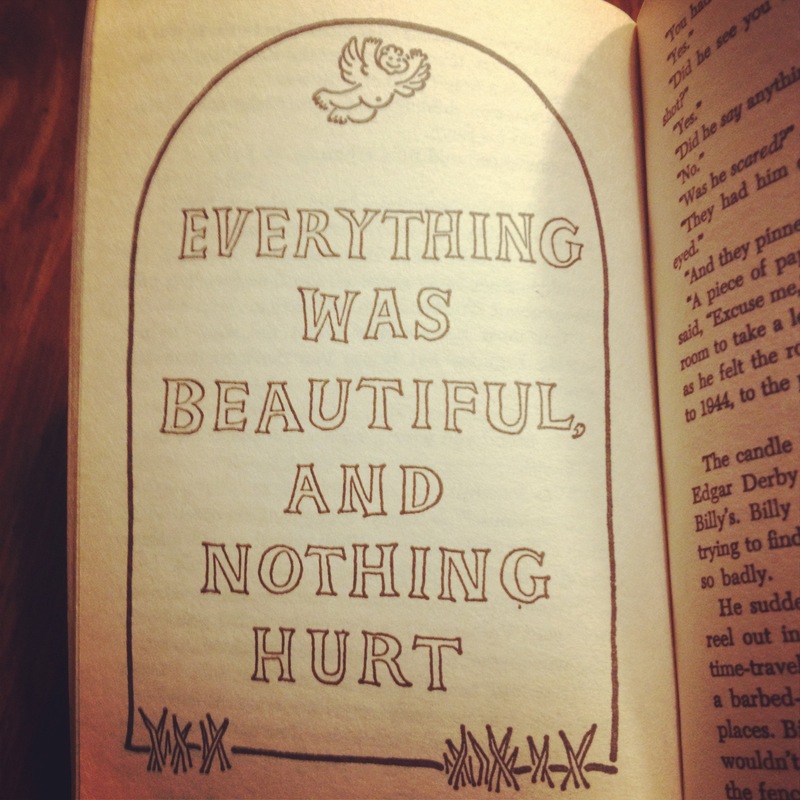 And that “everything was beautiful” line is certainly not from the Bible; it’s from Slaughterhouse-5, a book that is very different from the Bible. But the one thing Slaughterhouse-5 has in common with the Bible is that they both explore just how much life can hurt sometimes. And then I realize that the temptation toward that second reaction is just that…a temptation. It is a temptation to sidestep the path that God has let me walk. It’s a temptation to try to avoid the pain, when really, what I should do is to embrace the pain, just as much as I embrace the joy and the peace and the love. To embrace is not to wallow, but simply to accept that this is my life right now, and to see how God is going to get me through it. That is very important. I must remember how it feels. I must remember how God got me through it. And since then, others who are experiencing this kind of pain either know that they can come to me, or are even directed to me by someone else. It’s not that I have all the answers; it’s just that I’ve been there. And when people are suffering, they want someone who has been there. And I really, really want to comfort those people. Usually, it happens just by listening and empathizing. But sometimes I am able to tell them something, give them some morsel of hope that God has given me, and it helps them. And that’s what I think Paul was talking about in his letter to the Corinthians. Going through these experiences has taught me how important it is to experience and even embrace pain. I can’t help anyone if I’m too busy pretending that everything is beautiful and nothing hurts. And I can’t help them if I’m too wrapped up in my own suffering to see past myself (although that is an inevitable phase of pain, and sometimes it lasts longer than others). Instead, my understanding of the directory of pain spurs me on to really study my pain, to feel it as thoroughly as I can, to pour out all my hurt and my questions and my anger to God…and to see where that leads me. It always leads me somewhere. And often it leads me to a place that is truly beautiful…even though it does hurt. Kim, you made me laugh (“it floats!”) and pause (“as a member of the body of Christ, my pain is not my own”). I’ve faced the temptations you note – wallowing or denying – and found like you did that neither is what God calls us to do. Our pains are real and so is our God. Thanks, Tim! The word “paraclete” sounds familiar (probably from the two semesters of Greek I took and promptly forgot? ), but I needed to be reminded of its meaning. I love that image of comforting as “coming alongside.” Truly, that’s what comforting is, isn’t it? It’s not having all the answers or being able to make everything better; it is just coming alongside someone as they suffer and being willing to go through it with them. What a beautiful image God gives us! Becky, I think you are right that there is a physical correlation to these thoughts, as well. Good point. What a lesson. Thanks, Kim. I am sharing this message because it is something everyone needs to realize. Thank you, Mrs. Faye! I know that your congregation is facing its share of suffering right now. Know that you all are in my prayers! I can well relate. One example for me, in addition to losingmy own brother is the devastation of a divorce on a family. As my family has suffered the loss of my sisters marriage, it has been the most difficult thing so far. A lot because there is little beauty in such things, in betrayal and broken commitments. There is so little that is beautiful in watching those you love suffer the ways that one suffers under those circumstances. But there has been beauty in the suffering of a godly woman who chose to handle this ungodly thing in a godly way. Through pain she determined to make her part in it a good work for God – and so it was beautiful despite the pain it was. It still hurt, but the choice to make it something beautiful for God brOught healing that wouldn’t have been there otherwise I think. So, hurting gracefully can be a beautiful thing.